Patrick Fugit, Wrenn Schmidt, Philip Glenister. Does a good job of establishing small town America. There's a profound feeling of deja vu to the possession aspect. Whilst atmospheric it's really not scary at all. Whilst there's definitely potential in a drama series revolving around demonic possession and small town America, whether Outcast is that show remains to be seen. Outcast is the new show from The Walking Dead writer Robert Kirkman (based on the comic of the same name) set in the rustbelt small American town of Rome, West Virginia. A creepy introductory scene features a young boy quickly shattering the everyday domesticity of a daughter arguing with her mother with some disturbing behaviour. Kyle Barnes (Patrick Fugit) is a tortured squirrelly eyed loner and misfit generally shunned by his town folk because of events in his past. In fact the only person that seems to actually care about him is his adoptive sister Megan (Wrenn Schmidt) who is determined to not let him live in the dank squalid conditions of his former family home. Whilst Megan might care about Kyle her husband Mark (David Denman) like much of the town folk thinks he’s a dangerous misfit and doesn’t want him around their young daughter. Meanwhile smoking poker playing local Reverend Anderson (Philip Glenister) has come to the aid of the mother seen in the intro whose son is in the grip of a fearsome possession. Reverend Anderson soon seeks the help of Kyle saying the events he’s witnessed remind him of what happened in Kyle’s past. Scattered flashbacks to Kyle’s past reveal he suffered horrific abuse at the hands of his menacing mother, so bad that it still haunts him and his now elderly neighbour Norville (Willie C Carpenter) feels guilt over him and his late wife not taking action. The scattered flashbacks imply that Kyle’s mother and his former partner both suffered from demonic possession. Kyle whilst initially hesitant to get involved helps the beleaguered Reverend and realises the child’s possession is somehow connected to him. 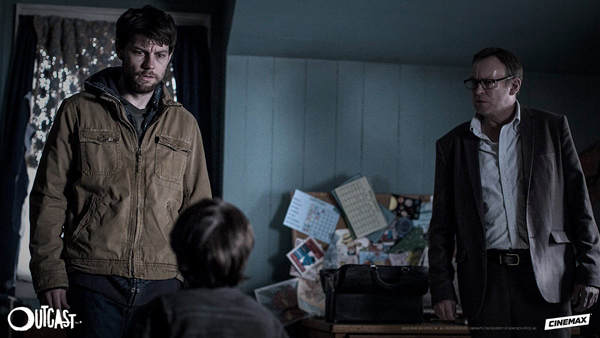 Outcast is a distinctly mixed bag horror drama, on one hand it does a pretty good job of establishing a small town where everybody knows everybody for good or ill and where events in your life can define you as a person regardless of what you do after them. The flipside to that though is the horror aspect whilst atmospherically shot by director Adam Wingard (director of You’re Next and The Guest) doesn’t really bring anything new to the table, it’s not really scary and if you’ve seen The Exorcist, The Exorcism of Emily Rose or any of the other countless films that revolve around demonic possession then you’ve already seen pretty much everything that Outcast has to offer in that regard, but unlike say American Horror Story it doesn’t have fun revelling in its cliches either. One of the most interesting/weird aspects of Outcast, for viewers in the UK anyways, is seeing Philip Glenister ,well known for playing the corrupt but fundamentally good Detective Chief Inspector Gene Hunt in Life on Mars and its follow up Ashes to Ashes, doing an American accent and doing it pretty damn well.